Ruth the Truth was born on the 21st of August 1968 after a very long and difficult labour. She was a caul baby and it was said by the consultant obstetrician at the time that such children were supposed to possess mystical powers. At the age of 4 these powers became apparent when she told her parents of a strange lady who had visited her during the night. She spoke in Turkish and told her father a secret that only his mother had known. It wasn’t until Ruth was 11 and at secondary school she realised that something was amiss. Up until that point she thought everyone could see the visions she did and hear the voices she listened to. Her grandmother a gifted psychic then took her under her wing, as she was the most receptive psychic she had ever known at such a young age. Ruth was highly intelligent and won a place at University where she studied Applied Microbiology. She now speaks of this time as one when she had to get to the truth of how she could do what she did. Leaving university with an upper second class honours degree shows that she was no fool. She then embarked on a research degree but missed the contact with other people and striving to help them. She completed her studies and then made a life changing decision and became a counsellor. Now married with a child on the way she realised that her gift, which had grown stronger, had to allow her to help many people. She became Britain’s first Psychic agony aunt with the Glasgow Evening Times and this lead to her well-received columns in Best Magazine and the News Of the World. She now has a regular weekly column in CHAT magazine and has worked for the Scottish Daily Record. She has worked on many TV programmes such as LK Today on GMTV, Richard and Judy, Mystic Challenge, Words with Wark and Scottish Women. Her broadcasting experience has also allowed her to work on local radio as in Scot F.M s Wee Fat Bob Show and BBC radio Scotland’s Mind Store, as well as making predictions on Johnny Walker Radio 2 Drive Time programme. On the Fred McAuley Radio Scotland show he made some amazing predictions, that there would be an earthquake in LA and that there would be evidence found that life had lived on Mars! Her biggest predictions to come true were the relationship between Geri Halliwell and Robbie Williams, the Zeebrugge disaster and problems over the general election 2001. Of course her description of a towering inferno in her predictions of 2001 written 10 months before the trade centre tragedy made her the most highly respected psychic in the world. The police have used her talents on many occasions as well as being targeted by members of the Business Community to predict their next moves. She is also interested in developing her ghost busting work, which has seen her being attacked by a ghoul in Grey Friars graveyard in Edinburgh. Her latest interest lies in the messages behind your dreams and this has seen Ruth study the subject to a high level. 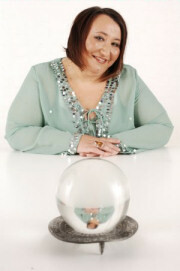 She helps people every week in her columns by using her unique psychic skills and knowledge of mind, body and spirit subjects. Recently she was the Corporate Darling at the 10th Birthday bash of the media shop in the prestigious Raddison Hotel. Ruth has two books published by Piatkus, Ruth The Truth’s Psychic Guide and Ruth The Truth’s Psychic Guide to Finding Love. Meeting Ruth is a once in a lifetime opportunity or your money back.